The Deer Creek Daisies visited 10 storybook gardens. They are shown walking down the path of The Wind and the Willow. Tulips, Hyacinths, Daffodils, Forsythia, Rhododendron were all in bloom. The group crossed a bridge overlooking swimming koi. Tall willow trees embraced the beautifully landscaped garden. From left to right: Connie Lindsey holding the storybook, Kendra Knecht, Shirley Pettit, Joyce Schlichter, Julie Schwartz, Jeanne Miller and Barbara Vance. The first day of the 2018 Home and Garden Show was held on Saturday, Feb. 17 at the Ohio Expo Center in Columbus. 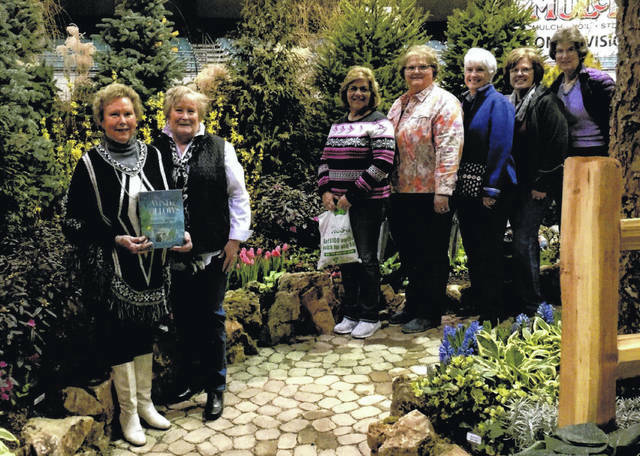 Seven members of the Deer Creek Daisies Garden Club came through the doors as the nine-day event kicked off at 10 a.m. This year’s theme in the Garden Center was entitled Storybook Gardens. Each storybook came to life, represented by a garden center and/or a landscaping service. The following books and gardens were visited. The Tortoise and the Hare by Cedarbrook Landscaping and Garden Center; Chicka Chicka Boom Boom by Five Seasons Landscape Management; The Lorax (Dr. Suess) by Hedge Landscape; The Secret Garden by Landscape Design Solutions; The Adventures of Huckleberry Finn by Oakland Nurseries; The Very Hungry Caterpillar by Riepenhoff Landscape; The Wind and the Willows by Seely’s Landscape Nursery; Hansel & Gretel by Shearer Patio & Landscaping; Charlotte’s Web by Warwick’s Landscaping; and Pete the Cat: I Love My White Shoes by Wood Landscape Service. All in attendance got to cast their ballot for the “People’s Choice” Award. All Deer Creek Daisies voted for The Tortoise and the Hare. Every storybook garden had its own unique garden design with garden statuary and designs. There were many garden items for sale. Garden statuary, plants, packages of numerous seeds, samples of mulch, flower pots, bird houses, hummingbird feeders, and much to see and learn about. A delightful lunch and meeting was held at Olive Garden in Grove City, hosted by Connie Lindsey and Shirley Pettit. Connie initiated a garden game with written questions handed to the members. They were to answer with the name of a flower. No hints were given, no scrambled names. Take the test and see how you do. How you might describe a silent person. Name for a lady who weds for riches. Everyone has these on their face. You might find these on a safari. An appropriate gift from a banker. A country of automobile lovers. Good name for a guy’s biking club. He’s an awfully sugary Bill. They’re the dairy best blooms. Cross between a violin and a clarinet. Here are the answers in no particular order. Snapdragon, Bachelor’s Button, Sweet William, Impatiens, Money Plant, Lady’s slipper, Tulips, Violet, Carnation, Dandelion, Tiger lilies, Marigold, Mum, Cyclamen, and Buttercups. The winner of the garden game with 12 correct answers was Jeanne Miller. She received a package of garden goodies. GARDEN TIP: Save your soil. Drainage holes in pots and containers are a mixed blessing. They let out excess water, but potting soil often goes along with it. The experts at Lowe’s Garden Center offers an easy solution: a coffee filter, which you can place over a drainage hole inside a pot.